Every year when summer melts into fall, we admittedly get pretty excited to revamp our wardrobe. Don’t get us wrong, we love the easy, breezy fashion that comes with warm weather—but the cool, crisp autumn air just gives us so many options. However, when fall turns into winter and multiple layers become mandatory as opposed to an option, we start to run out of cute cold weather outfits real quick. But guess what? Just because it’s freezing out, doesn’t mean we have to collectively resign ourselves to giving up on style—it just means we all have to think a bit more creatively when getting dressed in the morning. We promise: Great style—even during winter’s darkest days—is very possible. Here, a few of our top tips and tricks. And seriously, stay warm out there. There is a reason layering is always on-trend in the winter: It’s a massively practical way to dress when it’s really cold. So don’t be afraid to pile on the layers. A turtleneck, under a sweater, under a jacket, under a coat, for instance, will definitely keep you warm. So will a dress or skirt over a pair of pants (much warmer than a pair of tights). When it’s really, really cold outside, sometimes even the items in your wardrobe that you always depend on (everything from ripped jeans to cashmere sweaters) no longer cut it. This is when you have to find creative ways to layer under your clothes that no one will notice. You can, for instance, throw a pair of tights or sheer stockings under a pair of ripped jeans or layer a form-fitting sweater over a long-sleeve T-shirt. Also don’t be afraid to whip out the long johns you normally reserve for ski trips—sometimes during the winter they’ll come in just as handy for the walk to work. Great winter style really boils down to a great pair of boots. Got a great pair of over-the-knee boots? Show them off pairing them with a short dress. Have killer ankle boots you want to make sure the world gets to see? Pair them with cuffed jeans or a dress. And if it’s snowing and you are forced to wear less than fashionable snow boots? Use them as a jumping off point to put together a great new inventive outfit, rather than just throwing them on with just anything. By the middle of winter it’s pretty inevitable that you’re going to start to feel some fatigue when it comes to putting on your boring old winter coat day after day. Add new life to your coat simply by belting it. Cinching your waist will make it seem almost like you have a brand new coat. 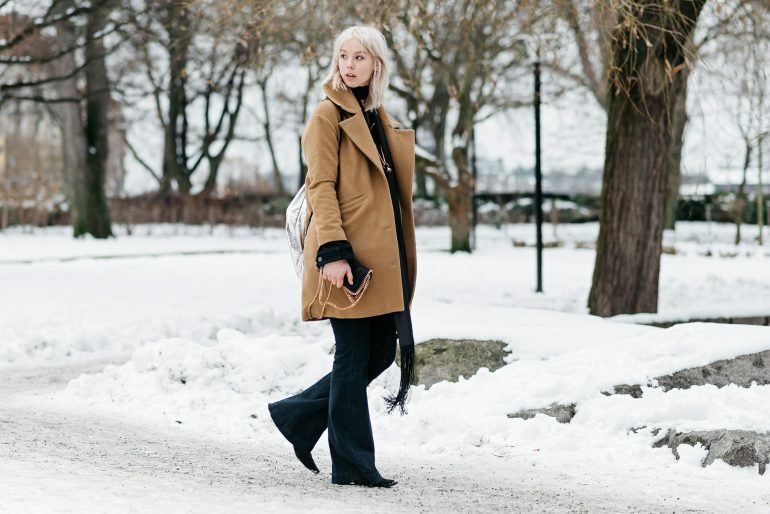 The best news of all: This styling trick will work with just about any coat style—we’ve even seen some serious fashionistas belt puffer coats! There aren’t many redeeming factors about living through really cold weather fashion wise, but it is the only time during the year that you can wear fur (or faux fur, of course). So just have fun with it! You can wear fur with just about anything to give your outfit an instant upgrade. Invest in a statement fur topper, throw on a fur gilet or stole over your winter coat, or find cool fur accent pieces like fur collars or even fur mittens to liven up your winter outfits.